Relacore is a health supplement that comes in the form of a diet pill, claiming to help the consumer lose belly fat, reduce stress, and even look younger. The product originates from The Carter Reed Company, based out of Utah, but unfortunately does not provide any other information aside from a “contact us” web portal page and a telephone number. So what’s the story behind Relacore? 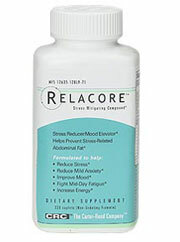 According to the product itself, Relacore in fact started off as an all natural supplement simply designed to reduce stress. However, the team accidentally discovered it to be anti-aging and weight reducing as well. Despite this sounding a little too much like a storybook discovery, our team of nutrition enthusiasts strives to keep our finger on the pulse of the weight loss world and could not wait to review this product and see what we could conclude. So let’s take a look at Relacore. Relacore alleges there is indeed a link between stress and aging, and initially embarked upon reducing stress by reducing overall cortisol levels - considered to be the stress hormone having a strong influence on appetite and blood sugar. However, the product’s methodology becomes convoluted in that there is no mention of cortisol beyond this point, and the website goes on to link weight gain and anti-aging with another term, “telomere”. So what happened to the cortisol? Your guess is as good as ours because the product fails to provide any hard evidence from this point on. And what is a telomere anyway? Although telomeres keep individual chromosomes from disintegrating, so to speak, and therefore along with the reduction of telomeres so too comes the deterioration of the chromosomes - which is essentially what aging is -there is no evidence from here on out as to how Relacore helps with this specific issue. It is agreed upon that as telomeres get older so do you; however, scientific research has shown that by simply taking proper multivitamins this may slow the process. So how does Relacore help? Unfortunately there is no information pertaining to how Relacore addresses this imbalance aside from the fact that it contains vitamins and minerals - which are not hard to come by and for that matter available for much cheaper prices than the consumer would pay for Relacore. Moreover, Relacore does not offer a full list of ingredients proportions, nor do they explain how their product otherwise sufficiently keeps the telomeres alive and kicking. However, although we do not know exactly what all of the proportions of ingredients are in Relacore, we do know that it contains a particularly nasty ingredient called “Chinese skullcap extract” which has been linked to hepatotoxicity, or damage to the liver. Plus, despite the initial claims that Relacore will positively reduce stress and improve mood, it seems contradictory that the product also contains Asian Ginseng - known for having unpredictable mood side effects. Although Relacore seems to have cute storybook origins in how they accidentally discovered one thing while trying to find another, unfortunately it seems the product does not disclose a sufficient amount of information to the buyer. Consumers should seek out weight loss products that not only list their total ingredient proportions but also provide a sufficient amount of explanation as to how they work. Moreover, it seems that if indeed the reduction of telomeres is what Relacore does (although there is not enough information to know whether this is the case or not), the consumer would be better off simply taking the proper vitamins and minerals - widely available and priced at much better rates than Relacore. Plus, there is zero evidence pertaining to Relacore reducing belly fat and customer reviews are hardly stellar, the most common complaints having to do with a sometimes decent calming effect but no reduction of weight. Bottom Line: Relacore incorporates a nice storyline but not nearly enough evidence or focus of approach to convince us of its effectiveness.